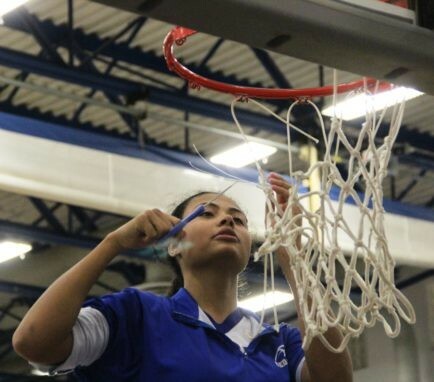 SOUTH LEBANON – Instruments: one sharpened scissors; one medium step ladder; one basket, elevated ten feet off a floor; and a whole bunch of wins. Instructions: 1. Place step ladder directly underneath basket. 2. Send individual contributors with scissors up ladder in ascending order of grades. 3. Have each player snip one net loop on hoop hook. 4. Repeat until net comes off. Yeah, there is a very specific method for cutting down nets. 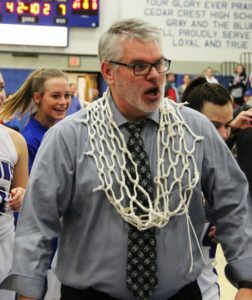 But it’s one that the Cedar Crest girls’ basketball program has learned and mastered. One of the secrets to the Falcons’ success is that they’ve been able to pass along the information from one group to the next. 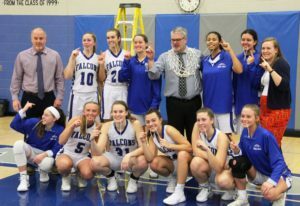 On Monday night at the ‘Falcon Cage’, Cedar Crest secured another Lancaster-Lebanon Section One championship, with a convincing 55-38 home triumph over Penn Manor. 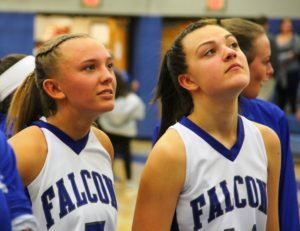 But not only did the victory check off the first goal on the Falcons’ seasonal list, it cemented their standing as the premiere program in the L-L’s big-school division. 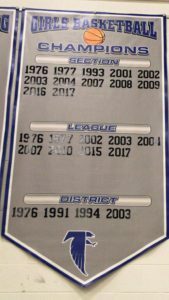 The section championship was Cedar Crest’s third in the last four years, sixth since 2007 and 13th overall. 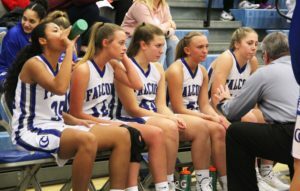 The Falcons are now 16-4 on the year and can complete a perfect 13-0 Section One season with a win at Manheim Township Tuesday night. 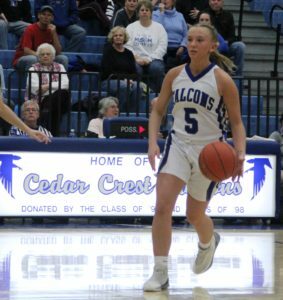 The top defensive team in the circuit and currently rated fifth in the District Three Class AAAAAA power rankings, Cedar Crest will compete as Section One champions in next week’s Lancaster-Lebanon League playoffs. The outcome dropped Penn Manor to 8-13 overall and 6-7 in the section. Back on January 11th in Millersville, the Falcons had scored a 42-33 road triumph over the Comets. 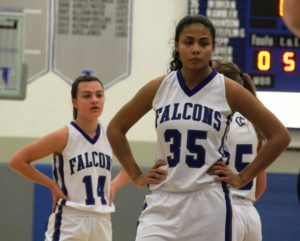 The Falcons got the job done mostly in the second half, behind another stellar outing from senior forward Raven Morgan. 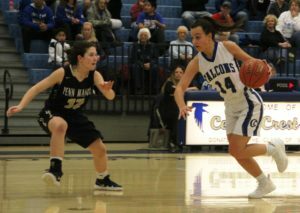 Cedar Crest used a Morgan-inspired 15-2 run to turn a 24-19 third-quarter lead into a rout. 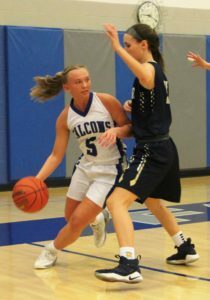 Morgan tallied ten points in the decisive 5:25 stretch, while teammate Reese Glover contributed a three-pointer and Kaitlin Kline nailed a jumper, as the Falcons carried a 39-21 advantage into the final eight minutes of play. 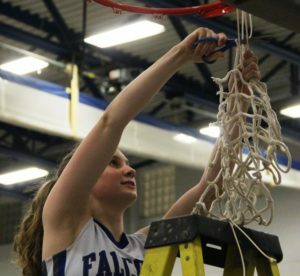 “They’ve been around me long enough,” said Donmoyer of a group that played a supporing role in the Falcons’ last section championship. “We’ve got a comfort level with each other. It’s a hard-working group. The team chemistry is awesome. But we’re going to live or die with our defense. 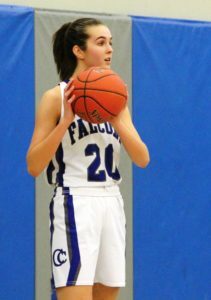 Morgan nailed a jumper to open the final quarter, and Cedar Crest led extended its lead to 20 points. 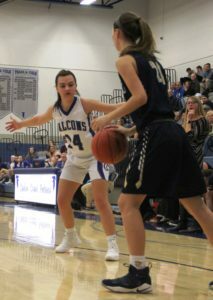 Later in the fourth, Morgan and Madison Rambler went inside for a couple of deuces to push the Falcons’ bulge to 48-24. It was at that point that the step ladder was removed from a storage closet and the scissors was sharpened. “The first half had me worried,” said Donmoyer. “But we’re always a second-half team. If we show up defensively, we’re in every game. I always like our chances. 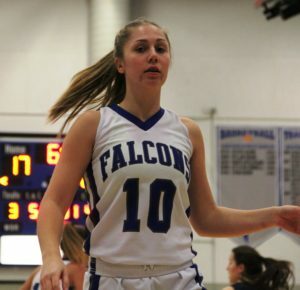 If Section One of the Lancaster-Lebanon League would name an MVP, Morgan would be her. 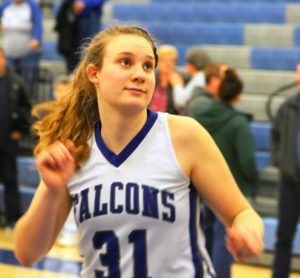 Combining talent and hustle, Morgan poured in a game-high 25 points on 11 two-pointers and three-for-three foul shooting, hauled down 17 rebounds and blocked five shots. 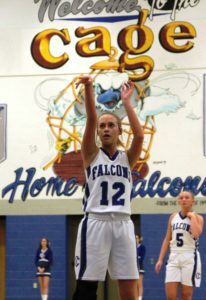 The Falcons also outscored the Comets 15-3 from ‘downtown’. 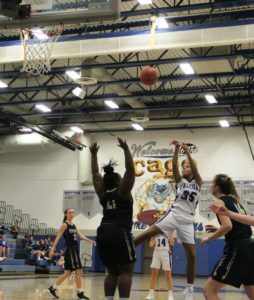 “She’s a four-year, starting varsity player,” said Donmoyer of Morgan. “She’s our most seasoned player, and she’s more focused. She’s a hard-nosed kid. She’s matured a little, and she does what she needs to do. 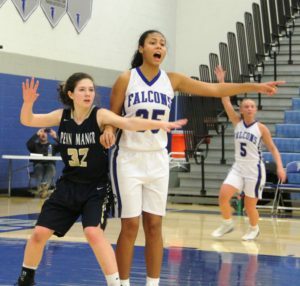 The Falcons led the entire way, after holding Penn Manor without a basket for the opening 3:16 of the contest. 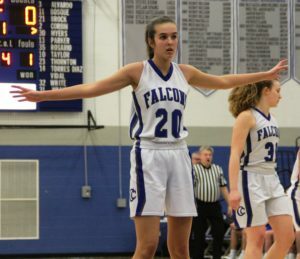 A three-pointer from Morgan Thomson gave Cedar Crest a 7-2 lead, and another Thomson trey three minutes later staked the Falcons to a 15-8 advantage. 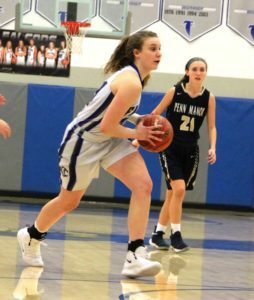 Then after the Comets closed to within 19-17 of the lead in the middle of the second period, Cedar Crest closed out the first half with buckets from Morgan and Hannah Woelfling to take a six-point cushion to the locker room. 1. Carla Munnion (1994) 2256 points.